Looks and feels like the real thing. Made with real cowhide layered over a heavily cushioned steal frame for durability. The bull features a rope and ball just below the neck for you to hold on tight. 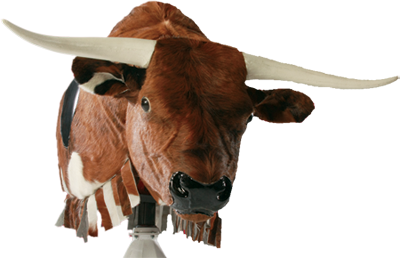 The bull head is made of soft foam for safety, but still looks like the real thing. Horns are made of a flexible rubber agent that bends upon contact to help prevent against injury.